Forms erect club-shaped stems with squarish or hexagonal tubercles in rows resembling "corn cobs". Habitat: Thorny bush-lands. 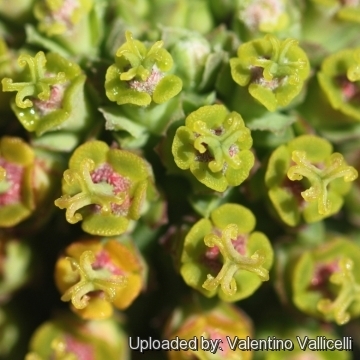 At some locations it is very common, often growing together with Euphorbia esculenta and Euphorbia ferox. 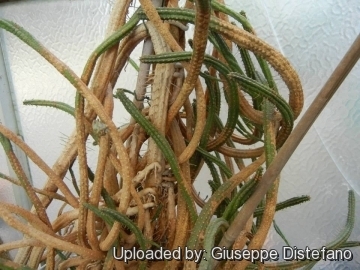 Description: It is a short stemmed dioecious shrublet producing a dense cluster. Stem: Thick deep green, erect, simple and ribbed, that in cultivated plants may branch above, 1,5-6 cm in diameter, Mature Height 20-35 cm tall. Usually there are many club-like lateral branches, starting about 10 cm and arches upward. Ribs: 7-17, with hexagonal crowded tubercles set in vertical rows after the manner of an ear of corn and separated by horizontal grooves. 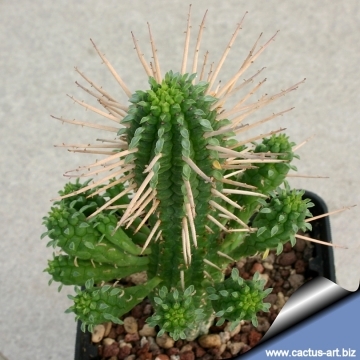 Spines: Occasionally present and scattered, thick, blunt and whitish, up to 1 cm long. 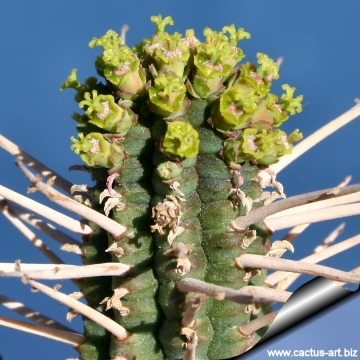 The “spines” are the solitary sterile peduncles. Flower: It produces yellow solitary cyathia at the tip of each stem. Peduncle ± 2 mm long with several bracts up to 3 mm long. Nectar glands elliptic, separate, yellow-green to purplish. Blooming season: Late winter to early summer. 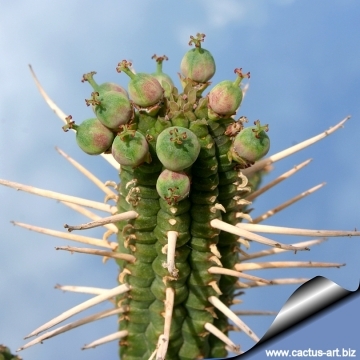 Fruits: Obtusely lobed, up to 6 mm in diameter, subsessile. Seeds: Ovoid, 3x2 mm, smooth. 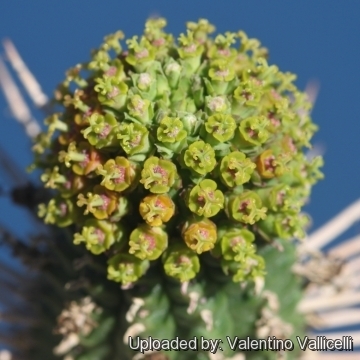 Remarks: Euphorbia fimbriata is similar to Euphorbia mammillaris but has conical stem tubercles. 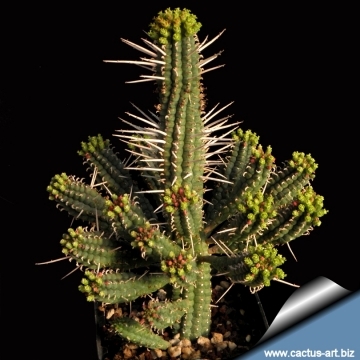 Euphorbia mammillaris L.: Short stemmed shrublet producing a dense clustered mound. 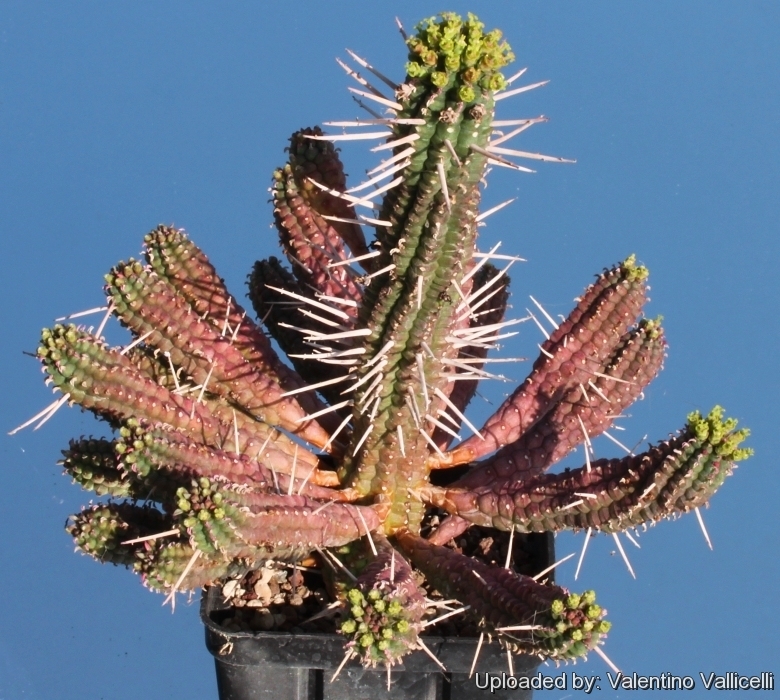 The stems have squarish or hexagonal tubercles in rows resembling "corn cobs"
Euphorbia mammillaris f. variegata: Very popular variegated form with with pale stems stripped in cremy-white and emerald green that turn pink in full sun during the winter . Cultivation and Propagation: It is an easy species to grow that is suited for any well drained soil in full sun. But young plant are happy growing indoors, where they can easily reach the ceiling. Give the plant an airy growing medium which mainly consists of non organic material such us clay, pumice, lava grit, and only a little peat or leaf-mould. Water regularly during the active growing season from March to September. No water should ever be allowed to stand around the roots. Keep almost completely dry in winter. It is a moderately fast grower, and will quickly become large landscape masterpieces in just 3-5 years. Only downside is from strong winds, the columns often smash into each other, causing permanent scarring... best to plant in such a location where winds are not a big issue. If plant becomes very red, this is a sign that the roots have not developed properly. It is a relatively fast growing and long lived plant and once established, it will be content in its position and with its soil for years. It can tolerate moderate shade, and a plant that has been growing in shade should be slowly hardened off before placing it in full sun as the plant will be severely scorched if moved too suddenly from shade into sun. Like quite small pots, repott in very later winter, early spring. Can be pruned for shape and branching. Frost tender, frost free zones only. Plant Pests: Prone to mealy bugs and rarely scale. Propagation: It is easy to propagate by cuttings in late spring to summer, just take a cutting of the plant let it dry for 1 or 2 weeks and stuff it in the ground (preferably dry, loose, extremely well draining soil). 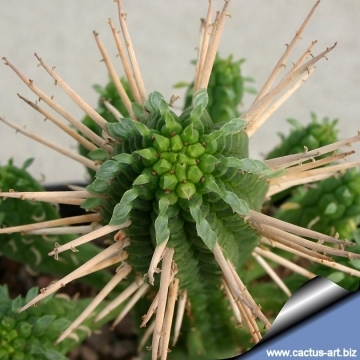 Warning: All Euphorbias contain a white sap that can be irritating to eyes and mucous membranes. If contact is made with this white sap, take care to not touch face or eyes before washing hands with soap and water.